We are a specialist box nursery located in Suffolk supplying box (buxus) trees for box parterres and knot gardens, box edging for potagers and herb gardens, box hedging, box topiary, bonsai and specimen box trees and shrubs. If you are looking for one buxus tree or thousands, for delivery anywhere in the UK or Europe, then we can help you. You are welcome to visit the nursery to collect your order if you wish. 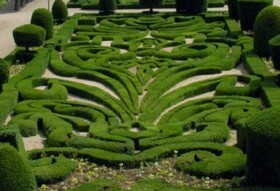 Most of the plants are for box hedges, or for growing on as specimen shrubs or topiary. In addition, we do have some topiary, 'instant' ready-clipped hedging and large buxus sempervirens plants available. For information on designing, planting and maintaining a box hedge, please see the hedging section of this website. 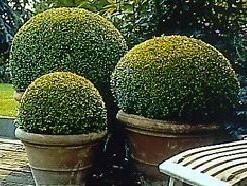 Similarly, the topiary page shows how to grow, maintain and grow box topiary plants. Details of the box plants currently available for sale are on the prices page. We also now offer a comprehensive range of yew hedging and topiary plants, as well as laurel hedging, holly hedging and bay hedging and topiary. If you have any queries about the plants for sale, or about box or gardening in general, then please email or telephone 01502 578598. Please see our special offers page for selected top quality hedging and topiary plants at discount prices.